Alexei Borisov & Olga Nosova “Elektrokooperativ” (CD, Industrial Culture Records, UK) out now! June 5th, 2010 by kornev received Comments Off on Alexei Borisov & Olga Nosova “Elektrokooperativ” (CD, Industrial Culture Records, UK) out now! … as a result there is a fusion of rational and irrational, symbolic and pure logical became new release of Alexei Borisov and Olga Nosova entitled “Elektrokooperativ”. The title of this improvisational work was inspired by Dziga Vertov’s documentary “The 11th”. Getting rid of acoustic instruments the duo decided to work only with electronics of different generations and origins. 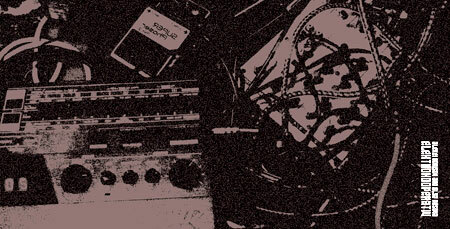 The idea was to combine “mechanical” possibilities of old Korg drum machine, tb-303, sh-101, V-drum, custom generators and effects with voices and electronic percussion, recorded in real time. Borisov/Nosova duo was formed in Moscow (RF), april 2009. 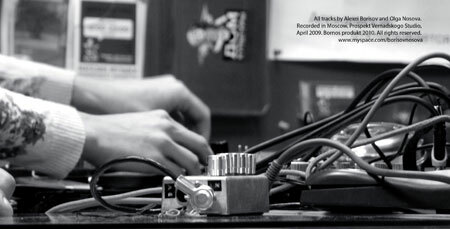 Music components: free improvised, live electronics, noise, electro-acoustic, spoken word, tape music etc. The duo collaborates with different musicians, sound artists, video-artists and poets from different countries: Anton Nikkila (Finland), Dave Phillips (Switzerland), Matthieu Werchowsky (France), Dora Bleu (Canada), Thomas Buckner (USA), Tom Smith (USA), Jandek (USA), Edyta Fil (Poland), Kim_Nasung (Poland), Ilya Belorukov (Russia), Fear Konstruktor (Russia), Sergei Letov (Russia), Volga (Russia), Rafal Mazur (Poland), Alexei Rafiev (Russia), Nikita Tsymbal (Russia) and more…. Produces music for silent movies (“The 11th” by Dziga Vertov), art exhibitions and multi-media events. “Elektrokooperativ” by Alexei Borisov and Olga Nosova – the title of this improvisational work was inspired by Dziga Vertov’s documentary “The 11th”. Getting rid of acoustic instruments the duo decided to work only with electronics of different generations and origins. The idea was to combine “mechanical” possibilities of old Korg drum machine, tb-303, sh-101, V-drum, custom generators and effects with voices and electronic percussion, recorded in real time. Material on CD format will be available on May through Industrial Culture Records. Below, there is short interview with both artists which might to get you closer to their concept and forthcoming album. Your album “Elektrokooperativ” will be released on May through Industrial Culture. It is your second common collaboration. What we can expect on this material and how you can compare it to first release? Olga Nosova: The first release of us (Istanbul Kebap) is a live recording, done at Spectro Festival and it exists only as a net-album. Elektrokooperativ is a studio recording. Alexei Borisov: But both releases are products of improvisation. And we’ve used different instruments except our voices and Roland TB 303 which are represented in both recordings. What happen, by the way, that you have decided to start this cooperation? Where idea on common creating of sounds came from? AB: We played together in a band Motherfathers and finally decided to try to work as a duo. Soon we realised that our collaboration worked well. ON: At one of the “terrible” concerts of Motherfathers (as I thought in that moment) Alexei has heard interesting moments in combination of electronics and acoustic drums. And than he suggested to play together. How look like whole creation process on these tracks? Did you create “Elektrokooperativ” material basing on some paradigm? How much did you plan before session and how much was creative freedom? AB: I have some analogue electronics, mostly from the 80-s, and Olga has electronic drums (Roland V-Drum), so we decided to try to record something using this staff. At the beginning we did not know what music should come out as a result. But finally we realized that we could do something rhythmical and even melodic. ON: We just tried ourselves in different formations+we planed only something like “let’s do smth with these instruments or let’s do some electro staff”+It was spontaneous decision to use only electronics without guitars and acoustic drums. Our freedom was limited only by instruments. What lyrics area is talking about? How important lyrics are in your music and in general reception of “Elektrokooperativ”? AB: Lyrics is a result of a verbal improvisation with some elements of surrealism and mechanical writing. Lyrics is a part of musical scape in general. Lyrics (and voices) have the same importance as music. ON: You shouldn’t try to percept it separately from music because it’s not songs in standard meaning. This entry was posted on Saturday, June 5th, 2010 at 03:05. You can follow any responses to this entry through the RSS 2.0 feed. Both comments and pings are currently closed.